WhiteKnightTwo during a low-level flyover June 20, 2009 at the Las Cruces International Airport in New Mexico. 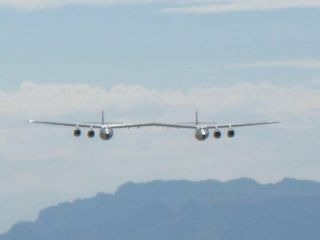 LAS CRUCES, New Mexico – The flying launch pad, WhiteKnightTwo, made three low level flyovers here today at the Las Cruces International Airport – a continuation of celebrations for the groundbreaking of nearby Spaceport America. WhiteKnightTwo is undergoing an extensive program of test flights, including long duration jaunts from its California home base at Mojave Air and Space Port. The exotic looking aircraft – seemingly a catamaran of the sky – was en route to the June 19 groundbreaking ceremonies at Spaceport America. A slight technical difficulty curtailed that plan, with the mega-craft landing in Phoenix. Today, lifting off from Phoenix, WhiteKnightTwo then winged its way here, cruising overhead in near cloudless skies. For onlookers gathered on the tarmac at the Las Cruces International Airport – including this reporter – the low level, over the runway flybys were indeed impressive. The huge mothership of a craft is undergoing an ever-expanding list of test objectives. WhiteKnightTwo is the launch system for the six passenger/two pilot SpaceShipTwo suborbital rocket plane, an effort backed by Sir Richard Branson's Virgin Galactic spaceliner company. According to Virgin Galactic officials here, expect to see the unveiling of SpaceShipTwo this coming December. That rocketship, like WhiteKnightTwo, is a product of a skilled workforce at Scaled Composites, headquartered at the Mojave Air and Space Port.